The following installation instructions are a recommendation, but are not intended as a definitive project specification. They are presented in an attempt to be used with recommended installation procedures, as published by the Tile Council of America and as specified by the American National Standards Institute (ANSI). All subfloor work should be in accordance with the recommended procedures as published by the Tile Council of North America (TCNA) and the American National Standards Institute (ANSI). Concrete subfloor should be level, properly sloped and structurally sound. Inspect concrete subfloor for any open cracks and fill with a high-grade epoxy filler. Remove any excess concrete lumps or residue that may interfere with the installation of the Manton Cork Underlayment. 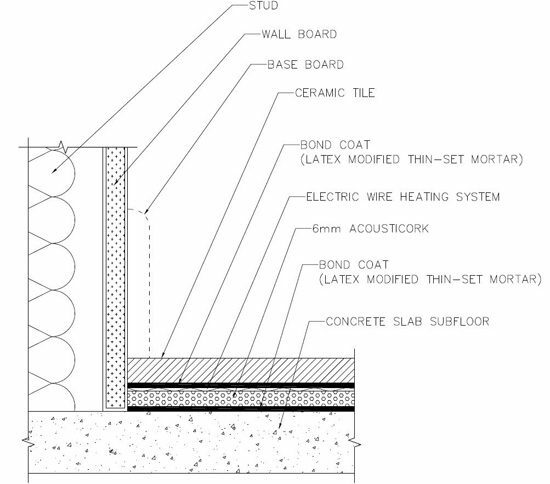 Test any concrete slab subfloor in direct contact with the ground, either above or below grade, for excessive moisture vapor transmission prior to the installation of the MantonCork underlayment. If excessive moisture is present in the subfloor, normally >5 lbs. per 1000 s/f in 24hrs as per ASTM Test # F1869-04 (Calcium Chloride Test), some form of moisture vapor-retarding remediation must be installed to correct the problem. Consult the project architect or flooring adhesive manufacturer for details. Starting in one corner of the space to be covered, measure the length of the space and cut a piece, or several pieces, of MantonCork underlayment to fit the length of the space to be covered. Snap a chalk line on the floor along the edge of the material farthest from the wall. Move the MantonCork material out of the way to begin applying the adhesive. Using a properly sized V-notched trowel (minimum 1/8″) apply a Latex-Modified Thin-Set Mortar compliant to ANSI Standard 118.4 in the area between the chalk line and the wall down the entire length of the area to be covered. Lay the MantonCork material into the bed of adhesive mortar applied, butting the pieces tightly against each other. Trim the last piece to length to fit the space to be covered. Snap another chalk line the width of the MantonCork sheets from the edge of the previously laid sheets and repeat the process of applying the adhesive and installing the sheets, starting with a ½ sheet on alternating rows to stagger the seams. Proceed to cover the entire room, making sure the sheets are tightly butted together, without gaps. Roll the floor in both directions using a 50 to 100# floor roller. After completion, the MantonCork material should cover the entire floor area without gaps and be securely bonded with any joints tightly butted. It is recommended that you wait 24hours for the mortar to set before proceeding. It is important to read and follow the Electrical Heating Systems Manufacturers Instructions COMPLETELY with regard to the installation of and the connection of the system to the Electrical System of the building. When fastening any clips or retaining devices for the wire heating system, it may be necessary to use a mechanical fastener that will fully penetrate the Manton Cork product and go into the subfloor. Please follow the heating system manufacturer’s instructions with regard to their fastening requirements. Be sure to perform any connectivity testing prior to the installation of the finished flooring. 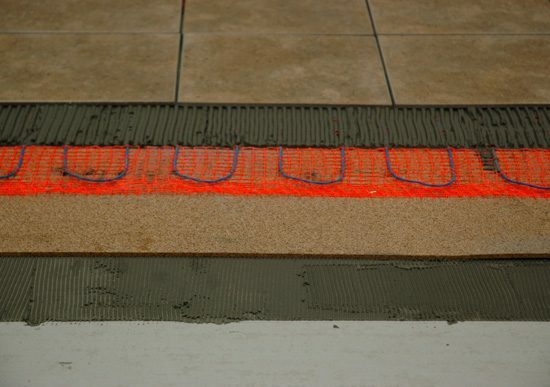 Follow the tile and setting material manufacturers recommended instructions for the installation of the finished floor tile conforming to ANSI A108.1 A, B, C and A108.5, depending on the method of installation. Direct bonded applications of tile should be done with a Latex Modified Thin-Set Mortar compliant to ANSI Standard 118.4. Note: The use of plastic trowels is recommended by some manufacturers, to avoid damaging any wires during the tile setting process. Perform another connectivity test prior to the installation of the grout.